On this day, a Wednesday, Ranald MacDonald arrived at the bay of Nagasaki on the Tenjinmaru. On board he was interrogated by the most talented ‘Dutch Interpreter’ of his day, Einosuke Moriyama (1820-1872). MacDonald and Moriyama became very close. Their friendship resulted in MacDonald becoming the first native speaker of English to teach his language to the Dutch Interpreters in Nagasaki. In turn MacDonald learned basic Japanese. After almost a year Ranald MacDonald was sent home on the USS Preble, an American man-of-war that happened to pass by. Five years later, during the negotiations between Matthew Calbraith Perry (1794-1858) of the United States of America and representatives of the Tokugawa shogunate about Japan opening up to the world, Moriyama was the most important interpreter. Later Moriyama’s contribution to the talks with delegates of Russia and the United Kingdom would be equally crucial. In 1862 he was a member of the first Japanese delegation to visit Europe. Ranald MacDonald reported to the United States Congress and subsequently roamed across the globe for several years. He received little recognition for his accomplishments. His memoirs were published when he had been dead for 30 years. 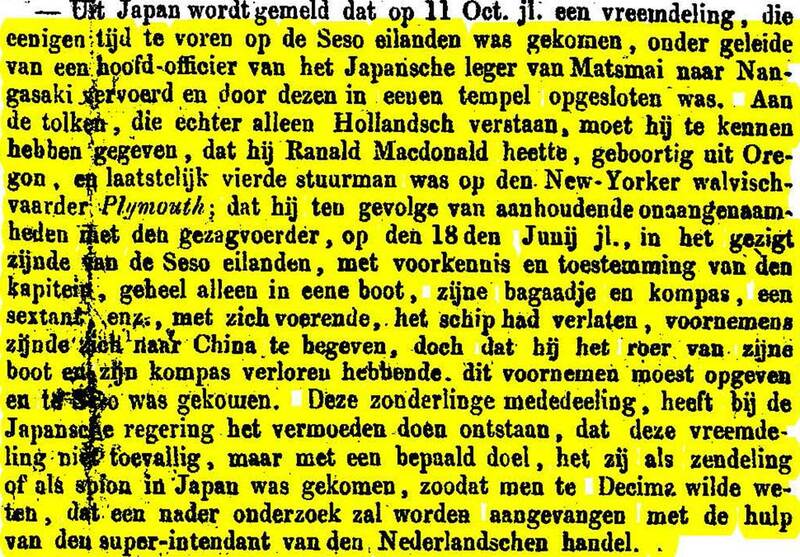 Dutch national newspapers mentioned MacDonald’s arrival in Nagasaki in March 1849, the delay being due to the news having to be delivered ‘over land’. 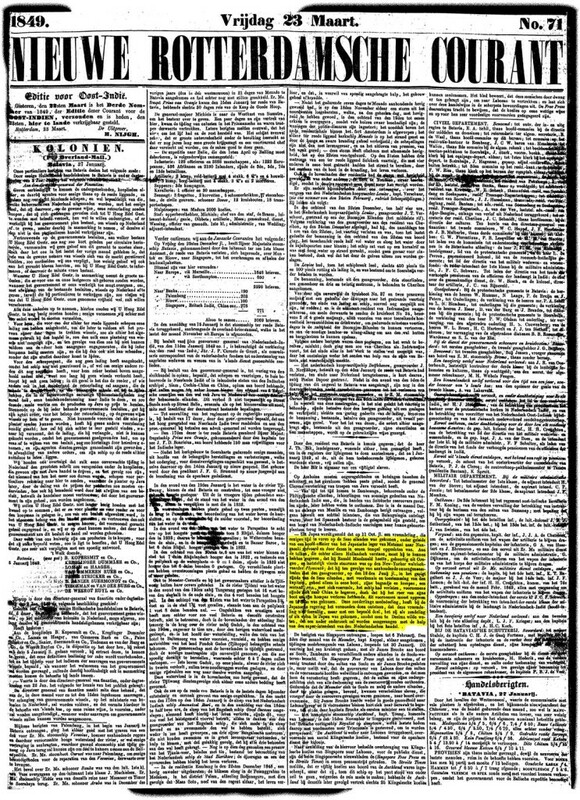 Here is one of the articles, mentioned by Frederik Schodt in his MacDonald biography.